This is the final post in the series best mutual funds of 2017 to invest in. Mutual funds that can invest in stocks across market capitalization are known as multicap funds. 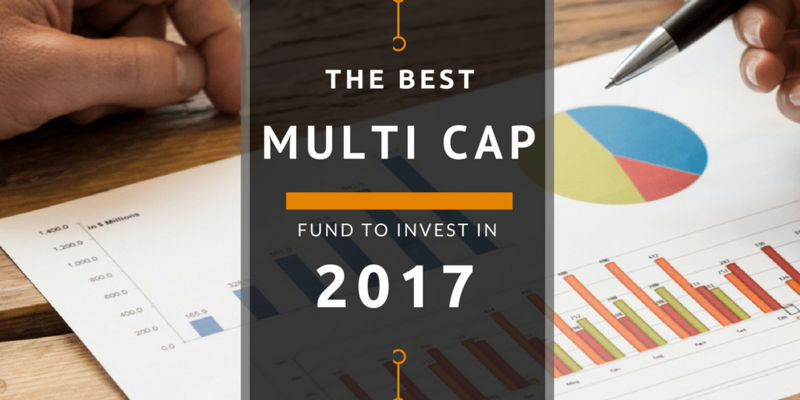 In simple terms, a fund that can invest in large cap companies as well as in mid and small cap companies is known as multicap fund. The biggest advantage of a multi-cap fund to large cap or midcap fund is – it doesn’t have a limitation to the amount of exposure it can take to midcap stocks in a rising market or a limitation of mid-cap fund that can’t move to large-cap stocks in a falling market to limit its fall but a multi-cap fund can change its nature according to the situation. Multicap fund is the best choice of fund for Indian retail investor who is looking to invest a small amount of money in the market every month through SIP. 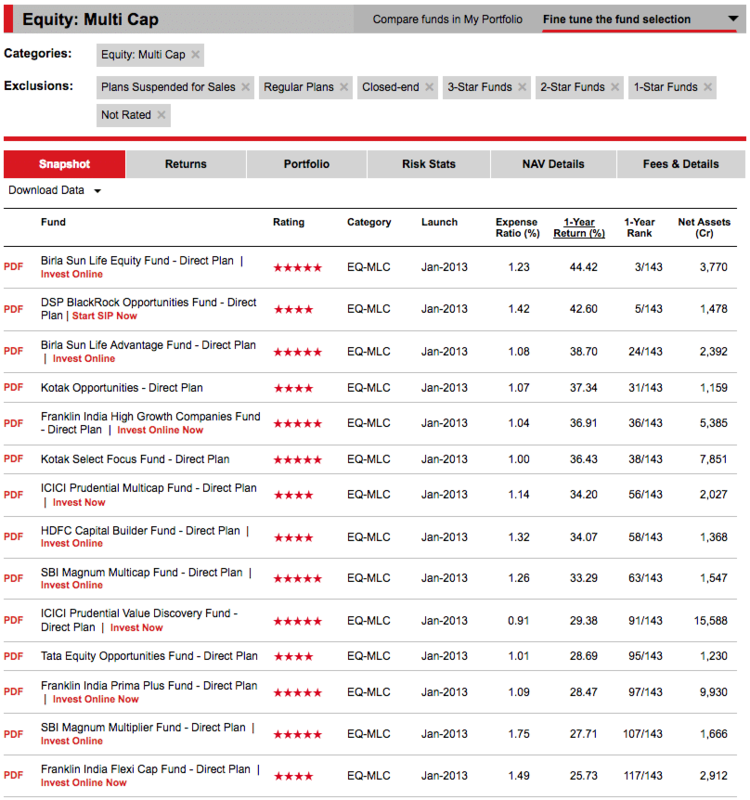 If one has to choose only one fund to invest in the market, his choice of a fund should always be a multi-cap fund. Let us assume that you want to invest ₹5000 per month as SIP. What will be allocation plan in large-cap, midcap and small-cap funds? The choice will be one of the following allocation to large cap, midcap and small cap fund. I can add few more rows by making few more kind of investors but the disadvantage to such an allocation is, it is based on a risk appetite of the individual investor and not on the based of growth potential of companies based on capitalization. Historically multi-cap funds outperform large cap funds and at par with small and mid cap funds. Midcaps provide better returns but are more volatile as well. So a midcap fund will show more volatile when compared to large cap fund. Multi-cap funds can dampen the volatility of the fund by investing in large-caps stocks and allow it to grow with midcaps stocks. So a multi-cap fund is for those who don’t want to take the trouble of asset allocation to right cap funds or for those who are new to equity mutual funds and don’t want to be seeing too much volatility and yet want best returns. We start with the 5 and 4 star rated multi-cap funds from ValueResearchOnline and select funds that manage more than 1000 crores of net assets. We avoid small funds as those small funds can have an issue hiring the best fund managers to manage the fund. The performance of multi-cap fund will depend on a lot more on the fund manager. Let us start with the benchmark of each fund. And select funds of broader benchmark as they have more stocks to outperform. We select Nifty 500 and S&P BSE 500 as the benchmark and avoid other funds. Multicap fund provides stability of large-cap stocks and returns of mid-cap making it take advantage of both the scenarios but it can also mean they can suffer when the call of the fund manager goes wrong. The long term consistency of the fund is more important because performance of the fund becomes highly dependent on the fund manager. So let us analyze the returns of funds for more time frame. The above matrix leaves us with the only best multi-cap funds. The only fund who has been able to provide a return of more than 15% for the last decade in the multi-cap category. Clearly a consistent outperformer and justifies more than 15 thousand crores worth of net asset under management. Vinay pointed out that ICICI Prudential Value Discovery Fund has not been a multicap fund but I could not find anything related to it in Google and so asked it in our FB group and this is when I found a reference to this article. The final verdict is ICICI Prudential Value Discovery Fund is not the best Multicap fund to invest in 2017 because it has performed well enough as midcap fund but not sure if it can perform as multi-cap fund as well. The 15k crore of Net asset may have forced them to move from midcap to large cap fund and so may have opted for a change in benchmark. It was launched on Jul 26, 2007, and so in next few months it will complete 10 years and this fund has shown a good promise for the last 5 years. Still when we have a clear stand out performer in the name of ICICI Prudential Value Discovery Fund and so there is no point to opt for the second best fund. It is not an endorsement that you invest only in the above funds but the emphasis is on the process that I followed to choose the best multi-cap funds for 2017 where I selected funds based on the consistent performance history.